Many people call reclamation "restoration." This is a gross misconception. The pits are left to become toxic lakes. The tailings ponds are left to evaporate (assuming it doesn't rain). We have two good examples: Ajo and Bisbee. Both are closed, yet they look the same as they did when in full operation. (By the way, the Ajo tailings pond dam was once the largest dam in the worldholding millions of gallons of toxic sludge.) Clean-up when and if the copper runs out, it may not happen soon, so those dams will get higher and higher. (How tall will they grow?) But when the mine does close and have to clean up its mess... what happens? The dams will stay there, the ocean of toxic waste with its dam walls will remain in place. At best, a layer of stones will be placed over the white powdery waste (when the water finally evaporates) to prevent the flying of toxic dust on windy days. Another problem is called "dewatering." When the mining operators have been pumping water out of the pit, (ie. dewatering the pit so operations can proceed), the pit will naturally fill-up when the operations and "dewatering" is abandoned. The result: a toxic lake. Nevada has been the victim of this phenomenon. See more information from Great Basin Mine Watch non-profit organization. Revegetation? Recreation site? What do you think? Even though some of us have lived in New England, we still appreciate the quiet beauty of the stark desert. There's not a single type of terrain here that does not support some type of creature, critter, or creepy crawler. They have all adapted in ways that are miraculous. The diversity of plants is also worth preserving. In addition to preventing erosion, they provide shelter and food for the desert birds and animals. We have all forgotten that there used to be view of the Sierritas Mountains to the westnote the hidden peaks on the photos. A site for a botanical garden? Better stilla rock garden? Plants will surely thrive on dust of toxic metals and sulfuric acidjust as humans do. 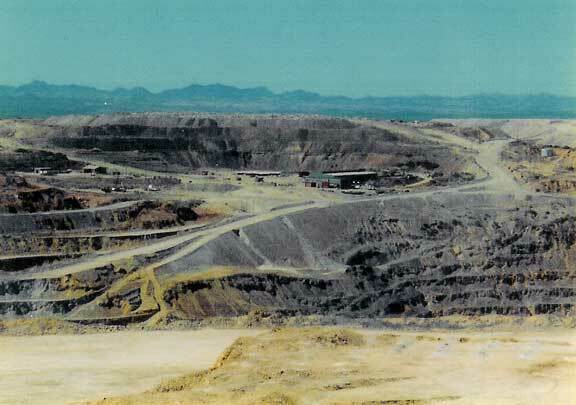 AZ Taxpayers Fund Mine Cleanups "According to government estimates the state of Arizona is home to approximately 100,000 inactive or abandoned mining sites, an estimated 3,000 of which pose an environmental risk (McCracken 2004)." Dewatering "Dewatering is the process of removing groundwater from the mine pits that extends below the water table." This means that when the mine is abandoned, the pit will fill up with groundwater and rain water, creating an artifical lake of toxic water. Reclamation as defined by BLM Those pits won't go away, those seas of sulfuric acid won't go away! Read and weep! It's the price we pay for having copper mines as neighbors.